This Jet Suit Lets You Fly Around Like "Iron Man"
The London store that's selling the jet suit offers training to anyone who buys it. The jet suit has a speed record of 32 miles per hour. Ever fancied a dab at being "Iron Man"? Now you can. A jet suite created by a British former commodities trader has gone on sale in a London department store with a cool price tag of 340,000 pounds ($443,428). 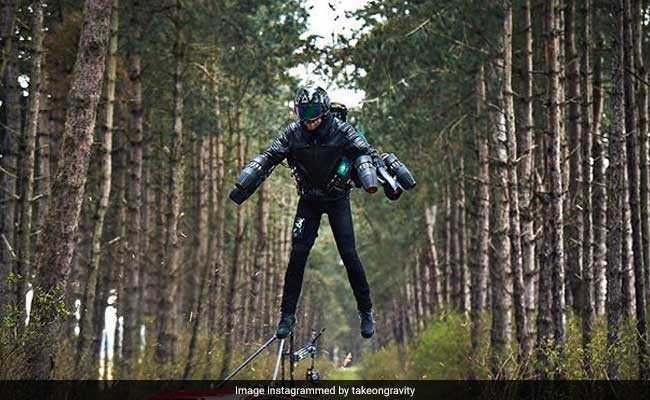 Made up of five miniature jet engines mounted on the pilot's arms and back, and also of electronics and 3D printed parts, the suit by Gravity Industries is reminiscent of the one worn by Robert Downey Jr as Marvel superhero "Iron Man". "This consumes about four litres a minute in the hover (position) so you can fly for three or four minutes quite easily and we have got another version - certainly on a cold day when you get more thrust, it'll fly for about nine minutes," he said. "That's something we're looking to improve but it's the inevitable consequence of flying without wings."